The DC Universe streaming platform introduces a new band of superheroes in the form of Doom Patrol. April Bowlby, who plays Rita Farr, aka Elasti-Woman, tells DQ about the ‘amazing’ experience of making the show. Bringing a much-loved comic book character to the screen can be a daunting experience for any actor, not least when that character is part of a hugely popular group of superheroes, with fans who have been following them for more than 50 years. That’s not been the case for April Bowlby, however, who says she has been warmly welcomed into the world of DC Comics and the on-screen DC Universe after signing up to star in Doom Patrol. Bowlby plays Rita Farr, aka Elasti-Woman, in the 13-part series commissioned by DC’s fledgling SVoD platform DC Universe. Farr is a former actress who develops the power to stretch, shrink and grow after being exposed to a toxic gas, leading her to link up with the other members of Doom Patrol: Robotman (Brendan Fraser), Negative Man (Matt Bomer) and Crazy Jane (Diane Guerrero), with the team led by modern-day mad scientist Dr Niles Caulder, otherwise known as The Chief (Timothy Dalton). Each of Doom Patrol’s members suffered horrible accidents that gave them superhuman abilities but also left them scarred and disfigured. Traumatised and downtrodden, the team finds purpose through The Chief, who brings them together to investigate the weirdest phenomena in existence and protect Earth from what they find. The show’s origins can be traced back to 1963, when writers Arnold Drake and Bob Haney and artist Bruno Premiani brought the characters to life in issue 80 of My Greatest Adventure. But if there was any pressure in portraying the character, Bowlby is afforded some freedom by the fact this is the first time Elasti-Woman will be seen on screen. “There are so many ways she could go. Luckily, I think the writers and the creators have found this beautiful balance of creative freedom and also following the [comic book writer] Grant Morrison version of the comics, which is dark and humorous. All the characters find themselves in crazy, wild and wacky situations, but they are all balanced with heart, kind of like the human condition. That’s the grounding of the show. The series, which debuts on February 15, is set after the events of fellow DC Universe series Titans, picking up with these reluctant heroes after The Chief is kidnapped and they are called to action by Cyborg (Joivan Wade), who comes to them with a mission that is hard to refuse but with a warning that is hard to ignore: their lives will never be the same again. 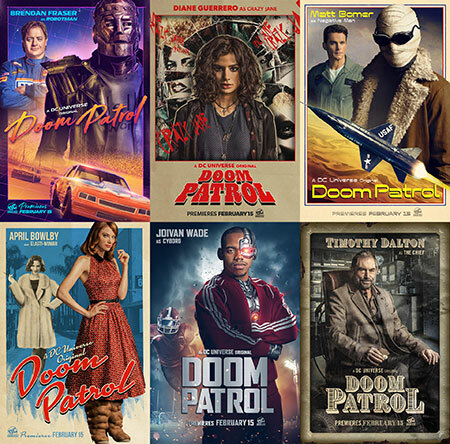 Doom Patrol is similar to many other superhero series in that it takes time to establish the backstory of each character and reveal how they acquired their unique abilities. Farr, Bowlby says, is a very sweet, incredibly beautiful actress who is admired by many until she is exposed to toxic gas that causes her skin to “blob out,” leading her to lock herself away from the world. The members of Doom Patrol have already appeared in an episode of Titans, suitably named Doom Patrol, which doubled as a backdoor pilot for a standalone series. During her initial audition, Bowlby read for a character in Titans who didn’t even have a name at that stage. When she finally landed the part, her manager revealed she would be playing Elasti-Woman in both Titans and the Doom Patrol series. Bowlby is best known for starring in all six seasons of fantasy legal drama Drop Dead Diva, which aired on US cable network Lifetime between 2009 and 2014. She’s also appeared in sitcoms Two & a Half Men and The Big Bang Theory. Joining Titans on the DC Universe platform, Doom Patrol is part of the wider DC television landscape that features characters such as Supergirl, The Flash and Green Arrow, which appear in series on US network The CW. Like those dramas, the new show comes from Berlanti Productions in association with Warner Bros Television. Executive producers include Greg Berlanti, Geoff Johns, Jeremy Carver and Sarah Schechter. But what is it that drives the ongoing popularity of superheroes on the small screen? “I’ve been trying to figure that out because it’s all very new to me,” admits Bowlby, who says her own superpower of choice would be the ability to fly. “I think it’s a little bit of escapism. Also, every superhero is broken in a way, so there’s this relatability of being wounded in this life and then to actually have the power and the voice to speak up and change things. It really speaks to the human condition.